You're a food lover after all, otherwise this article would not have piqued your interest. 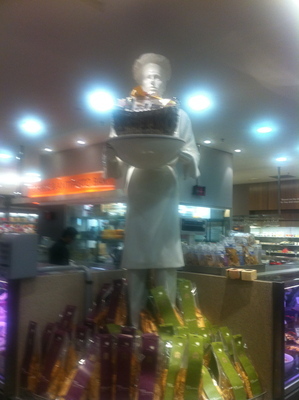 Any foodie will feel in a state of minor trance of heavenly bliss once they come to a David Jones Foodhall. In Sydney, there are a few. The ones that I have spent the most time in at are at Market Street in the city, as well as the one at Westfield's in Bondi Junction. 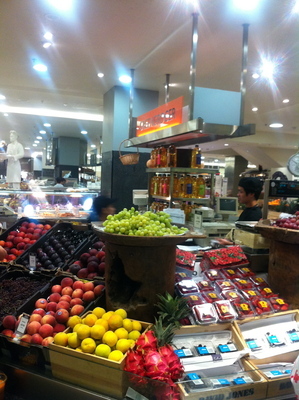 Finding yourself in opulent Westfield Sydney, there is a direct way to head inside Foodhalls. 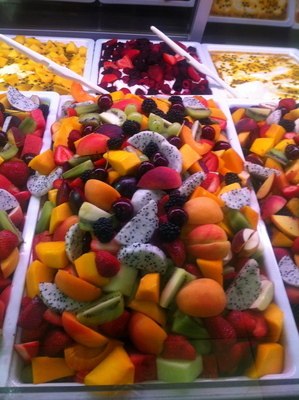 A place where fresh fruit and vegetables, meat, poultry, and antipasto treats are the order of the day. It feels like you're buying your groceries in exclusive Thomas Dux. 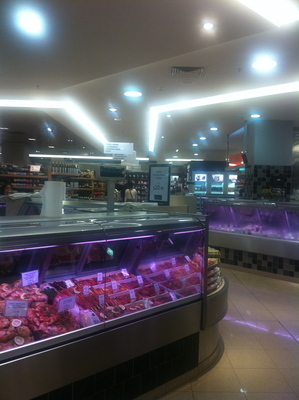 Come here on a weekend, you'll get to try a few samples that include gnocchi, and freshly cooked meat cuts. Way better than those supermarket samples. Indulgent gourmet treats. That designer table is also a keeper. It all comes together as a combination of local and international ingredients are used in all foods to eat in, and to take away. In terms of the packaged variety, some quality brands can be purchased. Kind of like Harrods in London, yet Harrods is way better. Think T2 teas, Santa Vittoria drinks, and Byron Bay Cookie Company cookies to name. This is where you are reminded that you only live life once. If you love food shows such as MasterChef LIVE, The Good Food and Wine Show, as well as any food exhibition at the Sydney Royal Easter Show; then you will feel like you're at home here. An occasional hub where I buy my groceries, and so far I have enjoyed fantastic lunches at the Oyster Bar; The Espresso Bar, and most recently the Noodle Bar, the latter being the most popular lunch bar in the Foodhalls in the city. There is a misconception that the food here is a little on the pricey end. Not true. 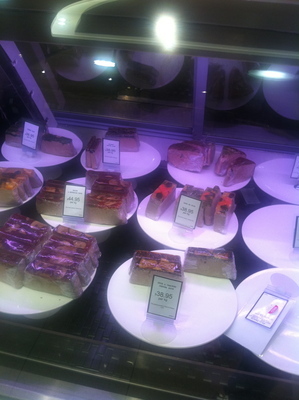 Like any take away outlet, David Jones Foodhalls sells some fresh, quality foods at sometimes half price. One dinner, I enjoyed some thai chilli chicken with noodles for only $5, and was way better than similar food for a similar 'about to close for the day' price nearby. In the seafood section right near the Sushi Bar, a quality piece of basa fish fillet, with salad and a complimentary sauce is only $5 all day. A great lunch or dinner treat. The honey mustard sauce is flavoursome and strong. The only qualm would be the serving size. Happy to pay a little more, or enjoy a little less salad for a bit more sauce. 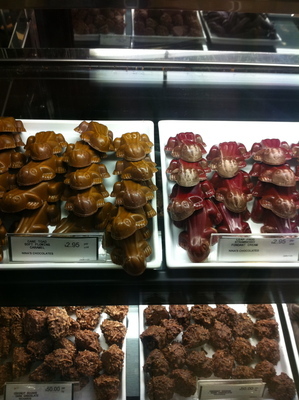 Their chocolate dipped fruit treats are simple heaven. So much food in the one place, and it's all adorable. 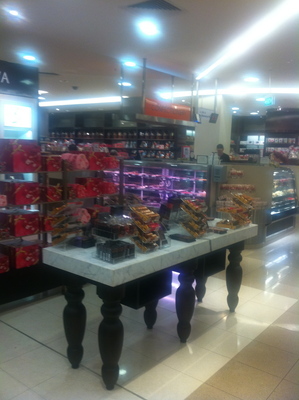 Where: David Jones Foodhall - Market Street Sydney and Westfield Bondi Junction. Why: Delicious gourmet food. Food lovers paradise. When: Anytime. Weekends are naturally busy. Grab a few food discounts late 1-2 hours prior to closing. Good for kids: More for the young at heart, yet kids will relish some of the foods here.